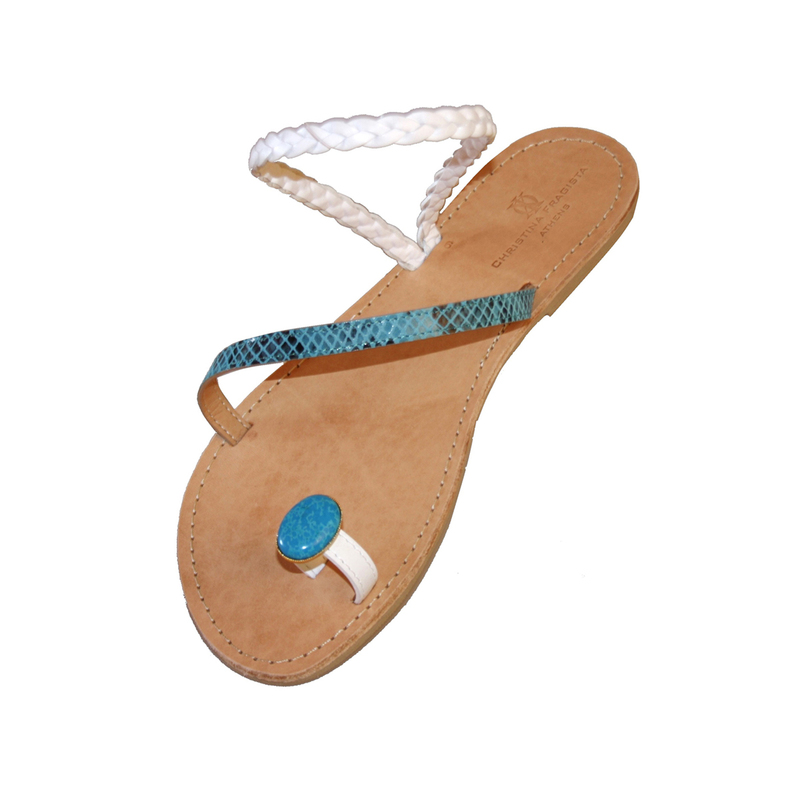 White and sea blue snake patterned leather straps fully lined. Decorated with gold plated oval decor made with turquoise blue semi precious stone. Hand cut leather soles with seam. Info about the island: Located on the west coast of Greece, Cephalonia is the largest of the Ionian Islands. Its diverse and dramatic scenery has made it a popular destination for discerning travelers. The filming of "Captain Corelli's Mandolin" has also put Cephalonia on the "must" travel destination list. If you typically wear a half-size we recommend ordering the next largest full size. ex. If you wear a 38.5, we recommend the next size, 39. If you have a very wide upper foot bridge, please bring this to our attention through e-mail. This also goes for those whose upper foot bridge is extremely thin. * Extra charges may apply for remote locations. In such cases, an email will be sent for your approval prior to shipment of your order. 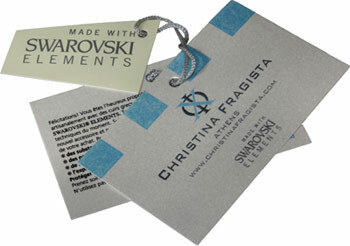 CHRISTINA FRAGISTA sandals does not deliver to P.O. Boxes. Please note that delivery outside of the EU may be subject to local import taxes and duties, which are your responsibility where they apply. Please note that we aim to dispatch all orders within the next working day. Orders must placed by 1.00 pm (CET) for same day dispatch. Orders placed on Friday (after 1pm), Saturday and Sunday will be processed on Monday or the next working day. Working days exclude Saturdays, Sundays and major public holidays. Estimated delivery times are to be used as a guide only and commence from the date of dispatch. CHRISTINA FRAGISTA sandals shall not be held responsible for delays in shipments caused by weather conditions, international customs issues or any other circumstances beyond our control. When the order has shipped, you will receive an e-mail specifying the tracking number and a direct link to monitor the status of your order.Orders are delivered between 9 am and 5 pm. Please make sure that someone will be available to receive and sign for your delivery. In case no one is available for the delivery, the courier will leave a message with a contact number you must call to arrange for your redelivery.